So…what exactly is in your kids’ toys now? An NPR report seeked out the answer to just that. Sadly, most toy companies gave the big “No Comment” to my beloved public radio. But Learning Curve and Mattel, maker of Barbie (and much, much more! ), did say they were using citrate-based plasticizers as well as a new chemical called DINCH. The citrates (citric acid esters) have been used as a replacement for phthalates in Europe since 2005. They’ve been deemed safe after much testing. But really, if the Euros trust ’em, so do I! The DINCH that stole Christmas…2009. Not so much testing for that other chemical. The German company BASF manufactures DINCH (in its odd acronym factory, apparently), and now it’s the most widely used phthalate substitute in the world. And so far, no peer-reviewed, publicly available studies are available. In the NPR story, California EPA toxicologist Stephen Dizio really eases our worries on this front. There are 80,000 chemicals in commerce. We know something about toxicity of about 400 of them. That really means that things come and go in the marketplace that you have no idea what will happen. Umm, great? Early studies of DINCH provided to European regulators by BASF showed that at medium doses, this chemical caused liver damage in male rats. But anything can be problematic in high doses. Europeans set limits on how much DINCH could be used in their plastic products. Well aren’t they brilliant! So are we…sort of. California, the West Coast’s Europe, has two new state laws that will soon require that manufacturers make a list of the chemicals in their products. That list will be available online to consumers. Hopefully soon, some other states will follow California’s lead and pass similar laws. Like maybe New England (or “Lower Canada”)? Then perhaps we can all have some clarity. 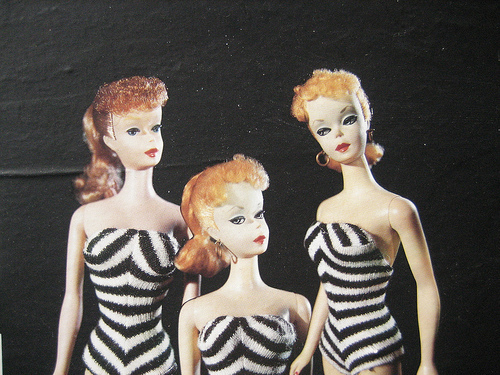 Image: luisvilla on Flickr, where there’s a surprising amount of disturbing Barbie pics. It’s under a Creative Commons License. It’s really appalling how this kind of thing repeats itself but the government can’t (or won’t) seem to keep up. Just like with bisphenol-A, I’m surprised how it gets to the market first before they let us know later on that it’s not safe. DINCH initially appears to be safer and more eco-friendly than the phthalates it’s replacing. So, it’s probably better, but still not ideal. I think a more important fact to know is that DINCH is being used as the replacement plasticizer for PVC. Regardless of the plasticizer being used, PVC is the worst plastic. Avoid PVC! Is there any way to identify plastics using citrates or DINCH, like a particular recycling symbol? Are they even recyclable? If our scientists are this sloppy, what makes you think our reactors are any safer than Chernobyl? We are one engineering error away from Armageddon at all times!